My sister and I dreaded those lauki-toru-parval days that tended to repeat themselves in never-ending cycles in our home. Mom had decreed that every meal must have a green vegetable, and our green vegetable selection was limited, especially in the summer, to the gourds. 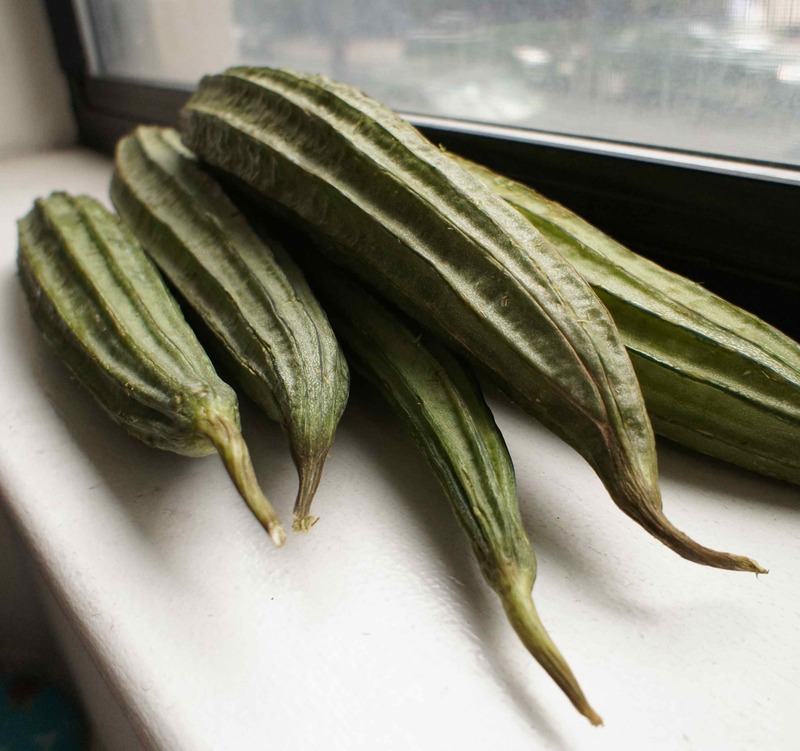 Bottle gourd, ridge gourd, snake gourd, ivy gourd, bitter gourd. This last one was especially unpopular. However, as we grew older, the dislike abated to indifference, and now, many years later, that indifference has yielded to longing. So much longing that when my mother-in-law is here, we go shopping together for all types of gourds in the Indian grocery stores. I look at her hopefully as we pass each bright green vegetable. “Can you make something from this,” I ask holding up a contorted shape. The answer is rarely no. 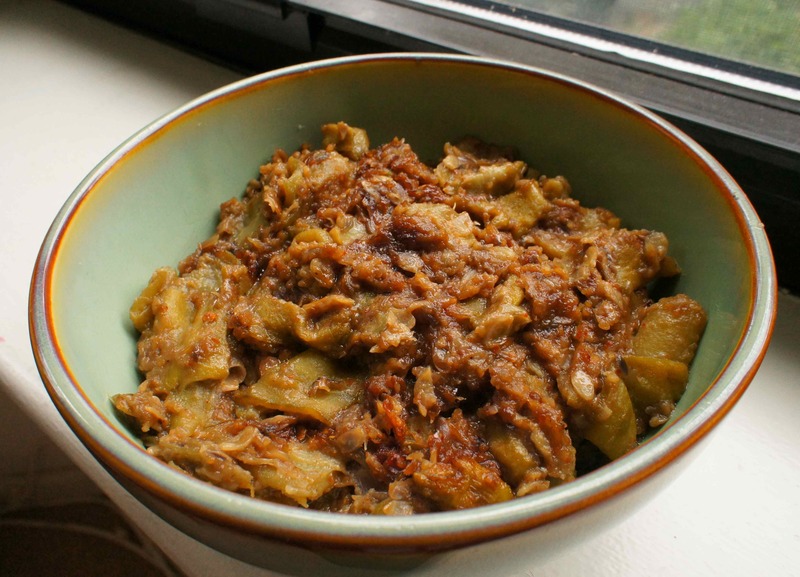 Here is her fantastic beerakaya (turayi or ridge gourd) recipe, made in a typical Andhra onion masala called ulli karam, which I’ve used before in a potato recipe called Bangala Dumpa Ulli Karam. The only difference is the addition of a spoonful of sugar in the onion spice paste here that lends itself well to the tender green flesh of the ridge gourds. This dish is succulent and particularly delicious when eaten with plain basmati rice and a drizzle of ghee. 1. Ridge gourds: Heat the oil in a big pan and add the chopped ridge gourds. Cook uncovered as the ridge gourds will release plenty of water. Cook for several minutes. Test with a knife and see if the pieces of ridge gourd are soft. Be careful to not overcook as the gourds will become mushy. 2. Wet masala: Heat the oil in a pan and fry the onions until light brown. Grind to a coarse paste with a little salt. Set aside. 3. Dry masala: In a little bit of ghee, dry roast the chana dal, urad dal, cumin seeds, mustard seeds and red chillies (in this order) until a fragrant smell is released, taking care to not over-darken or burn the lentils and spices. In a dry grinder or coffee grinder, coarsely grind the spices. Add this dry spice mixture to the ground onion paste and mix well. 4. Final assembly: Stir in the onion masala into the cooked ridge gourds which should be cooked and moist, but not too watery. Add salt and sugar, about a teaspoon or so, to taste. Cook on the flame for a few minutes. Serve hot with rice. This looks great – it is totally my sort of food. Full of flavour is definitely the way to go! Love your writing, your words are evocative enough to actually smell and taste the food….